The Houston Rockets have clinched the West Conference. This is a big moment for the Rockets as it also the first time since 2014 that a team other than the Golden State Warriors has won the West. The main man for the Rockets has been guard James Harden. Harden has been stellar this season with his deadly crossovers and ankle-breakers. 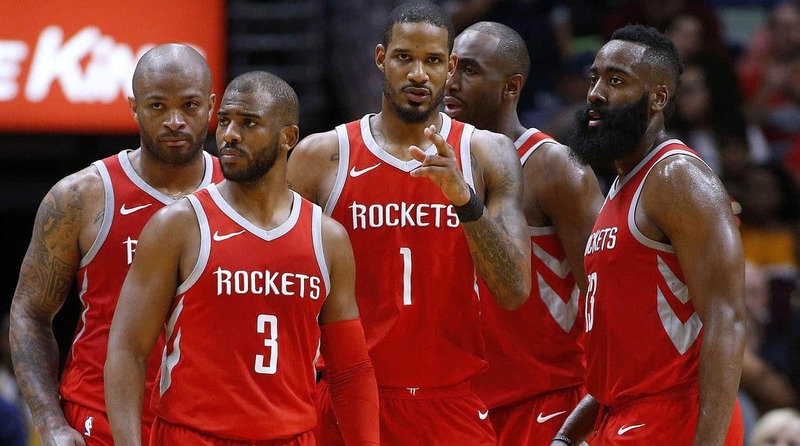 Also, with the additions of Chris Paul and Joe Johnson, the Rockets have established themselves as legitimate contenders to win the NBA Championship. However, the main question to ask is if the Rockets can beat the Warriors in a 7-game series. The Warriors are plagued by injuries with star players Steph Curry and Kevin Durant forced to sit out for weeks. The Rockets will need to take advantage of this fact, and look for ways to dominate the Warriors. This season , the Rockets lead the head- to- head match up against Golden State with a record of 2-1 against them. The main concern for the Rockets will be the frequent injuries to Clint Capela and Chris Paul. The Rockets are unstoppable with all three( James Harden, Chris Paul and Clint Capela) in the lineup. The Harden- Paul offense has been highly effective for the Rockets and the numbers prove it. Harden has been averaging a whooping 30.6 points per game and also an ankle- breaker per game. On March 1st, Harden utterly disrespected Wesley Johnson with one of the most deadly ankle- breakers of all time. He is also the front- runner for the Most Valuable Player Award competing with the likes of LeBron James and Anthony Davis. The Rockets have also amassed the most wins in season in franchise history with twenty games still left to go. Head Coach Mike D’ Antoni, who has previously coached the New York Knicks and the Los Angeles Lakers, has been great this season as he has successfully been able to use Harden and Paul to their maximum potential. He was also the coach of the Western Conference in the 2018 All- Star Game. Being the first seed, the Rockets will most likely either play the New Orleans Pelicans or the Denver Nuggets in the first round of the NBA Playoffs. Players like Gerald Green and PJ Tucker have proved highly effective off the bench keeping the points running. Gerald Green also scored a game- winning three against the Phoenix Suns with no time remaining. Last season, the Rockets lost in the conference semifinals to the San Antonio Spurs so the Rockets will be looking for revenge this year. The Rockets also should rest their star players like James Harden and Chris Paul to prevent injury and give them enough rest. This will also give the younger players a chance to prove their worth and the Rockets also have nothing to play for until the postseason. The NBA Postseason begins on April 15th. This is the first time in the 4- 5 years that a team in the West except Golden State has a legitimate chance to win it all and the whole world is watching to see if they can achieve it. The series versus Golden State is going to be watched by everyone, who want to see the Rockets make the NBA Finals. Did we forget the Rockets won two titles in the 1990’s? This is no first time friends, sorry! Yes, the Rockets have won the Championship before but they never were regular season champions or the 1st seed before. That’s what I meant when I said first time.